A while ago I made the Apple Pie in a Jar for holiday gifts, but realized I'd need to make something else to finish my list. Well, I was at the Whole Foods the other day (that very dangerous place...) and found Meyer lemons and key limes and got the idea to make lemon and lime curds. But when? Today I tried to get to work. I really, really tried. But there was a tanker truck that had turned over on the highway, so I went another way, and that was backed up, too. After being in the car for 45 minutes and getting only 1/4 of the way in (usually it takes me 35 minutes to get to work), it became clear that I was going to miss the only meeting on my calendar today, so I called in and declared that I was going home. 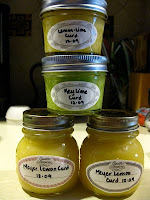 So I spent the day alternating between doing stuff for work and making Meyer Lemon Curd, lemon-lime curd, and key lime curd. YUM. But it's a LOT of work. 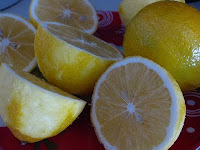 Especially grating the zest off the tiny little key limes and then juicing them. For the key lime curd I added a couple of drops of green food coloring to make it more "lime-ish" (and so I could tell the difference between the 2 kinds when I brought them out of the canner). They're very cute, in their wee little jars! This added 17 jars to my holiday gift stash, and maybe I'm done?